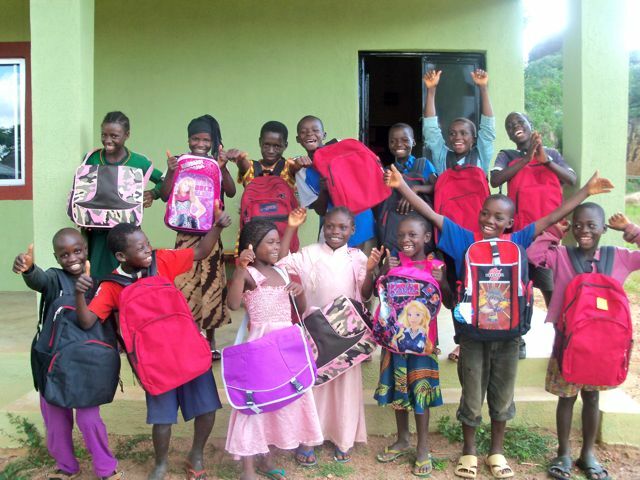 Children in Jos, Nigeria are overjoyed to receive new backpacks! Generous supporters of Back2Back donated backpacks a few months ago. Because the students will be starting school next week, we passed out the bags to them on Thursday. I wish we could have captured their excitement in a bottle! Their grins were ear-to-ear as they received the backpacks. Most of these children have never owned a backpack. Most of them have spent the past few years walking over an hour to school and carrying all of their books in a plastic bag along with them. The fact that they were receiving not only a backpack, but a new one from America made them ecstatic! It is so neat to see how many people God uses to bless these beautiful children from a village in Africa. I have no idea who all was involved in sending these bags, but the students felt loved and blessed because of it. Please continue to pray for the children, as they start their new school year at the Oasis Education Center. Back2Back Nigeria provides academic assistance and tutoring to children in the Kisayhip Village outside Jos. Last fall, we opened our doors to the Oasis Education Center to expand educational opportunities for the local orphans and impoverished children. By improving education and providing sponsorship, the children of Jos will have a brighter future.